Whether you’re building a brand new house or getting around to the remodel and renovations you’ve always dreamed about, making decisions about your home can be both exciting and overwhelming. The first question to ask yourself is: what are your project goals? Consider answering basic questions to narrow in on your priorities, such as how much money have you budgeted for new floors? And, what’s your lifestyle like (and how much time are you willing to spend to keep your floors looking like new)? Your answers to questions like these will influence the choices you make for your flooring and your whole project. What is my home’s style? Different materials work better than others to convey different styles. Warm and traditional hardwood will beautifully compliment the style of a craftsman home. If you have a modern loft space, clean porcelain tile with a graphic area rug might be for you. What is my home’s floor plan? Using the same flooring throughout an open-concept home will enhance the open, cohesive feel you love. Playing with different flooring types throughout your home can help you define your space as well, but we recommend using no more than three types of flooring throughout your home to maintain a consistent style. Am I a trendsetter? If you love being on the cutting-edge, don’t be afraid to follow popular trends in your flooring choice. Think wide-plank, grey, or whitewashed wood flooring. If you don’t love the idea of replacing your flooring in the next few years as trends come and go, stick with something more timeless and comfortable, like carpet. What styles and colors am I drawn to? Explore magazines and home-inspiration websites to determine which styles, colors, and moods appeal to you. How will your floors get used? To find floors that you love and that hold up to your expectations, you need to consider your family’s lifestyle. Who will be using the floor, and how? How long are you planning to live in the home? If the answer is a few years, you might want to select trendier flooring. If you’re planning to stay in this house for many years to come, choosing a more classic, durable material could be a good idea. Does anyone in your family suffer from asthma or allergies? 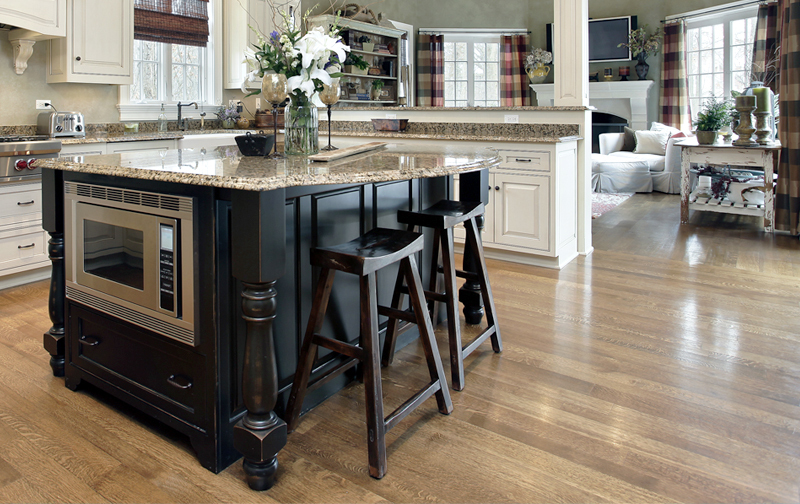 Hard-surface flooring might be the way to go for families that are concerned with air purity and ease of cleaning. Have you considered energy-efficient or green floors? Going green can bring you cost-savings in the long term, and it’s a smart investment even if you aren’t planning to stay in the home long-term. Energy efficiency will only become more desirable in the future. What area of your home are you remodeling? High-traffic areas like entryways and kitchens require more durable floors than guest bedrooms, for example. If you’re remodeling, there are a few key things to remember as you get started. Having your home under construction can be stressful and disrupt daily life—but it won’t last forever. Have a set budget in mind, but be prepared for some unexpected expenses, too. Especially in older homes, it’s difficult to know what’s underneath your current flooring or behind your walls until your project gets underway. Having a bit of extra money set aside for surprises before those surprises are discovered takes some stress out of the renovation. Know that your contractor and installers want to do your project well and complete it on time, but things happen. It may be too humid or cold to install your hardwood on the planned day, and your timeline may have to be adjusted. Just keep in mind that in the end, you’ll have beautiful floors and a renovation that you love. Whether you’re choosing your flooring type, making your flooring purchase, or making other interior design decisions, accurate measurements are critical. The size and measurements of your space determine how each choice you make comes out in the end. Kermans offers professional measuring services so you can be confident in your decision-making when it comes to your flooring. Kermans offers free, in-house consultation with our design experts. Bring in magazines, Pinterest boards, and whatever inspires you, and we will help you bring your vision to life. Our design consultants know flooring, and can make recommendations based on your lifestyle and home layout, too. Kermans Flooring is one of the largest flooring stores in the Indianapolis area, and we are proud to offer flooring options for every budget. Check out our library of free resources. From robust design inspiration resources to after-installation flooring care guides, the Kermans team is here to help every step of the way.